A very tight checking game in the 1st period led to a scoreless first two periods. The pace picked up a bit with Columbus pouring on some pressure in the 2nd, but couldn’t get one past Subban. The Blue Jackets came flying out of the break and scored just 40 seconds into the 3rd. Vegas started creating more offense but never could find the equalizer. Upcoming stories from the Vegas Golden Knights at Columbus Blue Jackets at Nationwide Arena. Why not pull the goalie earlier? The calmness that Stastny brings to the Golden Knights lineup. VGK has turned it up a bit, but I still feel like the great chances just aren't coming. If I'm Turk, I pull Subban really early here, like maybe even 4 or 5 minutes left to try and force the issue. Be smart with when you do it, but don't wait just to wait. This game did not start out well at all of the Golden Knights. Just 16 seconds in Artemi Panarin got the Blue Jackets on the board. Columbus scored again a few minutes later, but another offside challenge by the Golden Knights brought it back. Erik Haula tied it early in the 2nd, but things spiraled quickly after that. A messy 3rd period led to nothing and the Golden Knights dropped their fourth in five games. James Neal to the 3rd line? It may just make sense. Certainly not Reaves’ fault tonight, but this is kind of the story of the game. Who else but William Karlsson scores the game’s opening goal against his old team, hos 26th of the season. Columbus tied it and took a 2-1 but then the Golden Knights poured it on, and in a hurry. Three goals in just over five minutes gave the Golden Knights a two goal lead. An insane lead lob pass by Shea Theodore to Karlsson gave the Golden Knights their fifth of the night. Vegas hangs on with a late empty netter from Erik Haula. Upcoming stories from the Vegas Golden Knights at Columbus Blue Jackets at T-Mobile Arena. 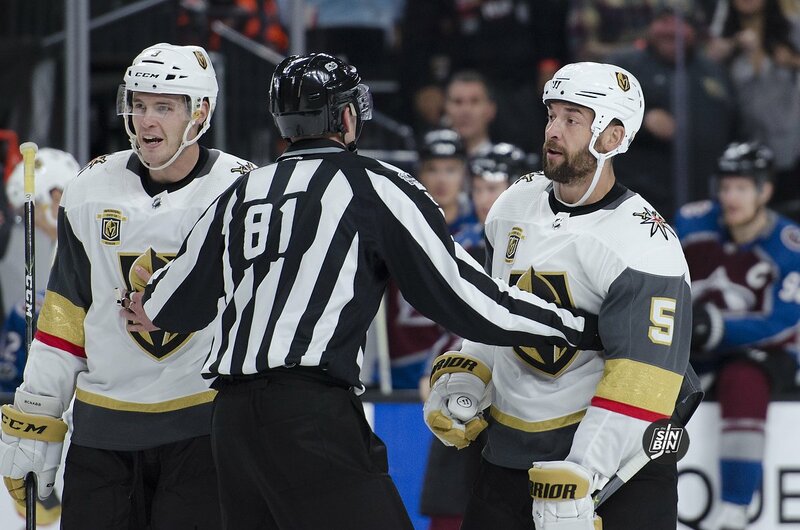 Photo gallery from SinBin.vegas’ superstar photographer Brandon Andreasen. The Hunt/Miller pairing took a bit to get back in sync, but now they are and they are putting up offense and a bunch of it. NHL rosters freeze at noon today, and all of the Original 30 must submit their protection lists to the league by 2 PM. But before all that, there’s been a quick rush of rumors, including one, in particular, that could be very lucrative for the Golden Knights. That means, don’t touch young guys like Joonas Korpisalo, Alexander Wennberg, and Josh Anderson, and also stay away from Jack Johnson and David Savard. In return, George McPhee gets a golden ticket, another first round pick. It’s unclear if this deal includes the Golden Knights taking David Clarkson‘s contract off Columbus’ hands. (He’s on long-term IR, but is still owed $5.25M per year until 2020). In less than a week George McPhee will finally have the protection lists in his hands and the Golden Knights will be on the 72 hour Expansion Draft clock. Until then, the hockey world will be buzzing about all the trades that are being discussed in the lead up. It’s time we take a moment to round em all up into one post, and try to make sense of what’s set to go down on June 21st. Before we start though, we need to clarify something. While McPhee is making calls and probably coming to agreements, Sportsnet’s Elliotte Friedman confirmed no deals will be made official, or even be announced, prior to June 21st. So, tread carefully out there, everyone’s trying to make a name for themselves. Chicago Blackhawks – The chatter with Chicago started in late May from a pair of tweets from TSN’s Frank Seravalli. The main question is which way the picks would be going, if any are involved. Chicago has three defensemen with NMCs, so van Riemsdyk would have to be exposed unless one of Brent Seabrook, Duncan Keith, or Niklas Hjalmarsson waives their NMC, and/or is traded. So, in theory, Vegas would be getting picks in exchange for taking on Marcus Kruger‘s salary, and simply select van Riemsdyk in the Expansion Draft. Many news outlets, including most notably a news anchor from Kansas City (why? ), have reported that Kruger to Vegas is done. The most common return is a 3rd round pick from Chicago. But there’s likely another piece to the puzzle here that’s missing. Whether that’s Chicago “moving a core player” as reported by WSCR’s Jay Zawaski, or Kruger being flipped through Vegas is yet to be seen. Either way, it’s highly probable McPhee makes a deal (or two) with Chicago, but the details out there currently, are likely not telling the whole story. Columbus Blue Jackets – In Elliotte Friedman’s “30 thoughts” column he mentions murmurs of trade discussions here. The name mentioned is David Clarkson, who is Expansion Draft exempt due to a long term injury. Clarkson’s back will likely keep him off the ice in 2017-18 and could be career ending, however, his cap hit remains at $5.25 million through 2020 (three more seasons). Freidman mentions the 24th overall pick as well as “some young forwards at the AHL level” as possible compensation for Clarkson’s contract. Once again, the details are fuzzy because this would occur outside the parameters of the Expansion Draft. Vegas would still have to select a player from Columbus, so there’s another piece in the mix. Joonas Korpisalo just signed a team-friendly deal, is he involved? Vegas would get rewarded handsomely for taking Clarkson off Columbus’ hands, but there still has to be an Expansion pick, so more is certainly to come on this one. The Columbus Blue Jackets recently announced they signed backup goaltender Joonas Korpisalo to a one-way, two-year contract, and you, Vegas fans, should be rejoicing. Why? Cause starting goaltender Sergei Bobrovsky has a NMC and isn’t going anywhere, which mean the 23-year-old Korpisalo may have just signed the perfect deal for Vegas. The deal will pay Korpisalo $700k this coming season and $1.1 million in 2018-18. Salary cap hit of $900k. He would have been RFA on 7/1. Guaranteed to be a exposed, Korpisalo is really the ideal expansion selection. At 23-years-old (we are going to keep reminding you of this) and with only 45 NHL starts the future is wide-open for the Finnish goalie. Assuming the Golden Knights believe in Korpisalo, he would have two-years to win the starting goaltending job. Korpisalo’s backup stats and starts took a dip this season. In 2015-2016, his record was 16-11-4 with a 2.60 GAA. This season he appeared in 17 fewer games and allowed more goals averaging 2.88 goals per game. His AHL stats declined as well. So again, Korpisalo could be considered a gamble, but… he’s also just 23-years-old.